In previous sections, we have covered different precautionary and prevention methods that you can employ before the onslaught of winter. Checking your roof and gutters, inspecting plumbing and pipes, and attending to your basement are all important steps in the winterizing process. Another step is waterproofing. The most thorough techniques you can use in preparing for winter will mean absolutely nothing if your home is not waterproof. Additional steps require the help of a professional. Real waterproofing may require construction and the use of industrial strength chemicals that should not be handled by untrained and unlicensed homeowners. Two of these methods are installing an interior drainage system and applying a sealant compound to your interior walls. The latter can actually be done on your own, but it is a much better idea to have a professional do it since the compounds they use will most likely be more effective than anything you can buy in a hardware store. When installing an interior drainage system, the floor at the base of your foundation walls is dug up and drainage trenches are installed to control the flow of water. These drainage trenches often have gravel bases for better absorption and end at a sump pump that pushes water away from the home. After the trench is nstalled and working properly, the floor can be re-installed over it. If you have block walls, you can also drill holes in the wall to lead directly to the interior drainage system. This will eliminate water problems in the basement. Sealants are another way to waterproof your basement. A common compound used in this process is called capillary waterproofing material. This compound can be applied on inside or outside walls and penetrates the cement several inches. It then crystallizes and prevents water from flowing in through the walls. Again, these compounds can be applied by anyone, but a waterproofing professional will have better materials, tools and experience in doing it correctly. Precipitation in the winter time can be heavy at times and you will always be faced with rain or snow coming down on your home. This can cause flooding through your roof or foundation, so the steps covered in previous sections can all help with the waterproofing process. In addition to these, you can also redirect water away from your foundation by digging drainage ditches, removing shrubbery that is too close to the house, and planting shrubbery away from the house on downward facing slopes to impede the flow of water. 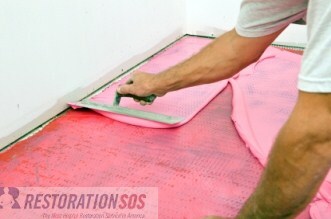 Waterproofing should also be done in other areas of your home besides the foundation and basement. Windows can be sealed in the winter and doorways should sit tight in their frames to prevent the entry or rain and snow. Chimneys and exhaust pipes in the roof should be sealed, and the flues and caps should be inspected to make sure they work correctly. A fresh coat of water resistant paint can also go a long way towards keeping water out. Seal everything up tight in the fall so you can have a pleasant, dry winter.